The fishing boat Louisa which sank in the Western Isles resulting in the deaths of three fishermen is back at sea. Renamed Nimrod, the crab boat is working in South West Cornwall. The convener of Western Isles Council has said that this news must evoke strong memories for the families of those involved with the Louisa. Louisa sank while at anchor off the Isle of Mingulay in the Outer Hebrides on April 9 2016. Skipper Paul Alliston and crewmen Martin Johnstone and Chris Morrison all perished. One survivor, Lachlan Armstrong, managed to swim to shore. An investigation by the Marine Accident Investigation Branch (MAIB) found that the boat was flooded by a deck hose. There were also delays in launching a rescue mission, a non-functioning liferaft and lifejackets which were not fit for purpose. It took nearly an hour to despatch a helicopter and lifeboat to the scene. The report found valuable time was lost trying to verify where the emergency occurred. The boat was raised and salvaged. 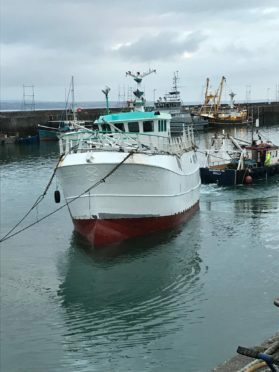 It has since been bought by Rowse Fishing where it is based in Newlyn, Cornwall. Normal Macdonald, convener of Western Isles Council, said: “I guess it happens from time to time. Generally fishermen can be quite superstitious. It’s not something that happens all that often. On his Facebook page, Rowse Fishing owner Mark Rowse said Nimrod, meaning mighty hunter, had been named after his grandfather. Mr Rowse was not available for comment yesterday. A spokeswoman for the MCA said: “The MCA can confirm that the vessel formerly known as the ‘Louisa’ which sank off the coast of Mingulay, Western Isles has undergone refitting work and is now operating off the South West of England coast. On the night of the tragedy, the men had been at sea for five days, harvesting crab and lobster and had anchored the 50ft boat about 650ft from the shore off Mingulay. But a hose used to clean the deck that evening had been left on, and at about 2.30am the crew woke up. While the ship was going down, they alerted the coastguard, but the emergency vessel failed to inflate as the gas canister to fill it was empty. The crew started cutting fenders from the railings to stuff in the raft to try and make it float, but it kept falling apart. And when the boat went under, they jumped on the raft, but the fenders started popping out and they were thrown into the water. Sole survivor Lachlann Armstrong described how he swam for his life, battling in complete darkness through water only a few degrees above freezing towards a shore he could not see. The 28-year-old said he became exhausted and numbed by the cold, lapsing in and out of consciousness and almost succumbing to the urge to give up and fall asleep. But he choked on a wave which shocked him awake and he found the strength to struggle onto the shore. Rescuers found him two-and-a-half hours later, half-naked and unable to stand and clinging to the rocks. The father-of-one said he believes that the life raft’s failure to inflate was the reason his crewmates died, as they instead chose to obey safety training manuals which tell fisherman to stay with the raft to boost survival chances.